With every photo you send, Lazy Susan will help a person in need. Above all, the Martha dining table boasts a charming visual design. The 'X-legs' of the table look rustic, and the matte boards of the tabletop create a modern impression of simplicity. In her special way, the Martha table will look great in your kitchen, dining room or conservatory. 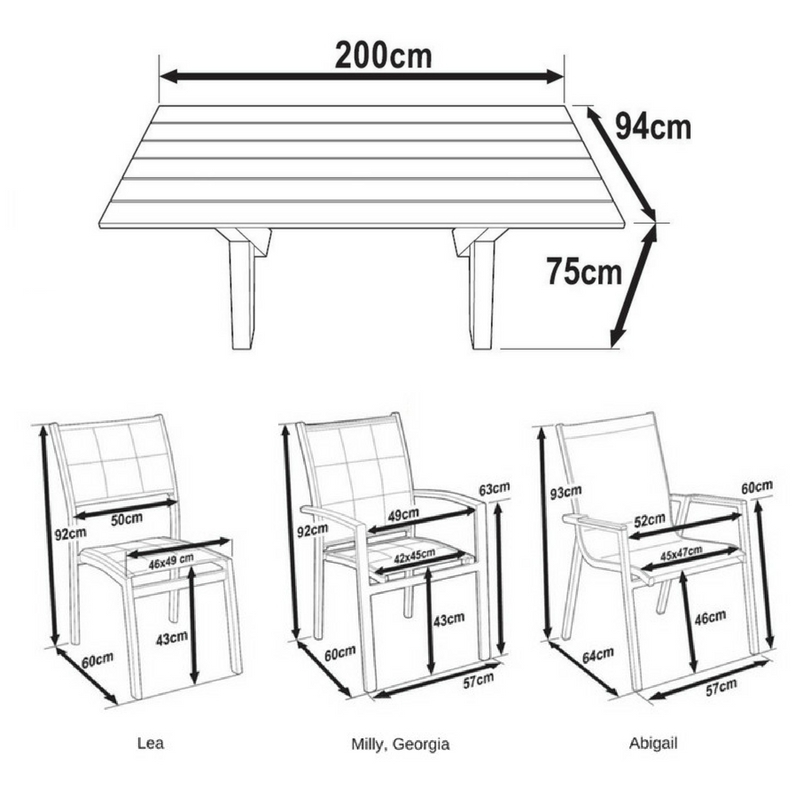 To match the table, choose 6 stacking chairs from the options displayed above. The chairs have aluminium frames that are remarkably light and strong, and are fitted with a heavy-duty mesh fabric that is sturdy and comfortable. Buy today at our unbeatable price - before this set sells out. When you buy the Martha table set, we offer discounts on further items, see the options above. Please, show us your furniture and help us raise money for our Do Some Good charity campaign. All you need to do is to take a few pictures and share them on Facebook or Instagram with the tag @LazySusanFurniture or email them to us. Lazy Susan will then donate £10 for any set of photos of Lazy Susan furniture in your dining or dining room, or £20 for photos including friends and family during a family lunch or BBQ. Your help goes a long way. Our indoor dining furniture range is made of modern materials in a timeless, simple style. Aluminium is strong, low maintenance, light, and easy to clean. Would you like to receive a < strong>free sample of the metal and the fabric? Just send us an email. Buy the complete table and chair dining set for Lazy Susan's best online deal. We deliver in the shortest possible time to your front door. Any further queries please contact (+44) 01243 71-71-97. By selecting this product, your order will be delivered on a wooden pallet on an appointment basis. Geodis, our pallet carrier, will call you to confirm the date and time slot of your convenience for the delivery. Please make sure you provide at least one or two contact phone numbers. Please note: All pallets are delivered to the kerbside ie. your front door. Signing for delivery:When receiving a delivery, please take a couple of minutes to check the condition of the packaging. If you suspect any damage, please accept the product but write one of the following statements on the delivery note: “damage to tabletop”, “damage to 2 x chairs”, “damage to parasol”. When unpacking, you will certainly notice that the products are in perfect condition. But if this is not the case, do not worry. Please just email us some pictures of the damages and we will sort it out for you! 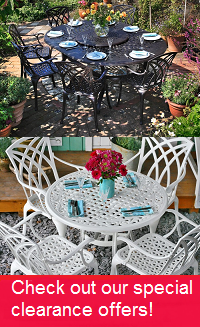 GIORGIO in BROADSTAIRS, kent has just ordered a Ivy Bistro Set - Antique Bronze (2 seater set). daniel in Middlesbrough, North Yorkshire has just ordered a Classic Metal & Fabric Sample Pack (Slate). Christopher in London, - has just ordered a Poppy Table - White & Champagne (4 seater set).